What do we eat when it's cloudy and rainy? Bring on the sun(chokes)! 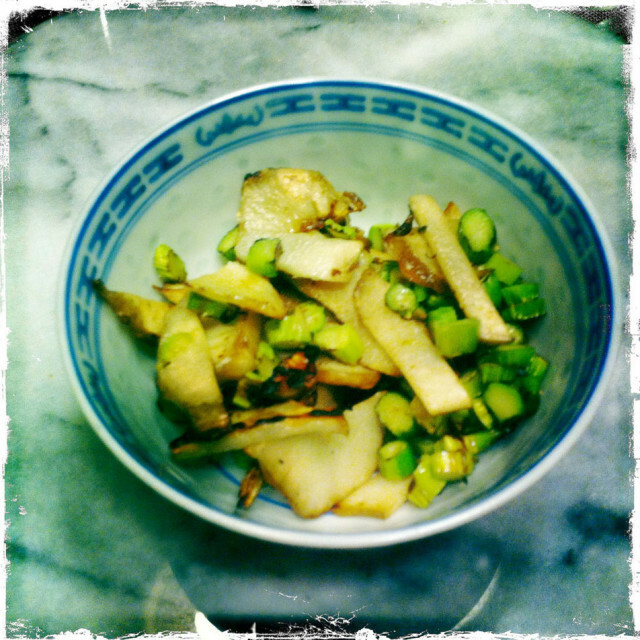 Sunchokes can be a diabetes-friendly replacement for potatoes (as in this stir fry with ultra-thinly sliced asparagus ends). While it’s still a ways until sunflowers bloom, we can enjoy them right now – just not out in the garden, but rather inside on the dinner plate. The tubers of sunflowers – that is, the gnarly, ginger-root-looking thing that grows underground – are as tasty to eat as the actual seeds. Not that the sunflower tuber and seed will ever be mistaken for each other. Actually, the Sunflower tuber – known as either Jerusalem Artichoke or “Sunchoke” – could easily be confused with potato, especially when roasted in olive oil. Or, when it’s raw, you might liken it to jicama. Either way, sunchokes are another of those lesser known but intriguing, funny looking but delicious vegetables that are fun to discover and experiment with. Like many other root vegetables, sunchokes are delicious eaten raw (sliced thin or in matchsticks) or cooked by steaming, braising, roasting, or sautéing. They are an easy replacement for potatoes, and an especially good choice for diabetics, since the carbs in sunchokes do not break down into sugars as the starch in potatoes does. Here’s a recipe for a salad of barely cooked (simmered two minutes) sunchokes, sliced thin and mixed with vinaigrette. And for a simple hot meal of sunchokes, try slicing and sautéing them. Add thinly sliced asparagus ends (see photo above) for color and contrast – next time you’re snapping off the tough ends of asparagus, slice the last inch or so from the stem but keep and slice ultra thin the rest of the snapped off end. 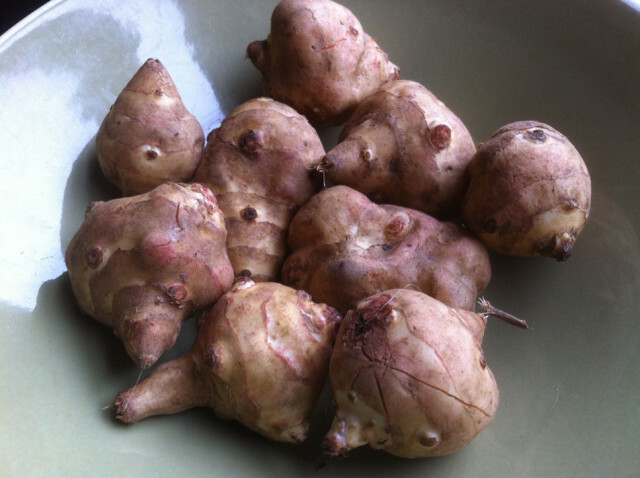 Sunchokes – aka Jerusalem Artichokes – are neither from Jerusalem nor are they artichokes. They are a bit gnarly, however, in their raw state. Cooked, they taste not unlike an artichoke heart. 2 to 3 large sunchokes, sliced 1/4-inch thick? 1 sprig fresh rosemary, leaves removed? And since you’re probably dying to know, the "Jerusalem" moniker supposedly comes from the Italian word for "sunflower" – "girasole."